This page is a translated version of the page Extension:Media Viewer/About and the translation is 2% complete. మీడియా వ్యూయర్ బొమ్మలను పెద్ద ఆకృతులలో చూడటంలో సహకరిస్తుంది. తద్వారా మెరుగైన బొమ్మలను చూసే అనుభూతి అందిస్తుంది. మీడియా వ్యూయర్ వికీపీడియా మరియు ఇతర వికీమీడియా సైట్లలో బొమ్మలను చూసే తీరును మెరుగు పరుస్తుంది. బొమ్మలను మరింత స్పష్టంగా, పెద్దగా చూడవచ్చు. ఇది వికీమీడియా ఫౌండేషన్ వారి మల్టిమీడియా టీం ద్వారా రూపొందించబడింది. This new multimedia browser displays images in larger size, with useful information about their contents, authors and related metadata. It also offers a number of features to enlarge, share, download or embed media files, as described below. Learn more about Media Viewer in this help page. Feedback is welcome in this discussion. 2 How does Media Viewer work? 3 How can I turn off this feature? 4 How can I re-enable this feature? 5 How can I report an issue? Media Viewer was created for readers and casual editors, the primary target users for this tool. Over time, these features can encourage them to contribute more to Wikipedia and Wikimedia sister projects. How does Media Viewer work? To open an image in Media Viewer, click on its thumbnail on any article, gallery or category page. 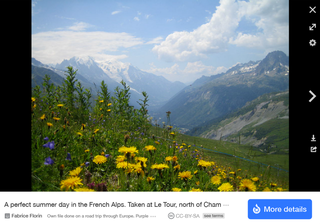 This will display a larger image in Media Viewer, right over the page where you clicked. These features are available every time you click on a thumbnail to open Media Viewer, as long as the tool is enabled. 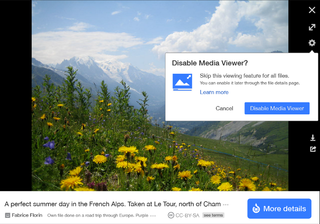 Media Viewer is now enabled by default on all Wikimedia sites, but can be disabled by any user, as described below. From a file description page, click on "Open in Media Viewer" below the image to view it with this tool. To learn more, read this help file. How can I turn off this feature? To disable Media Viewer, click on the 'cogs' icon at the top right corner of Media Viewer (see screenshot). Then click on "Disable Media Viewer." 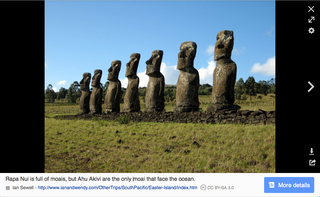 From now on, images will no longer open in Media Viewer: clicking on thumbnails will take you to the file description page on Wikimedia Commons or other file repository. This Disable feature works for registered users (using a site preference), as well as unregistered or 'anonymous' users (using a file stored locally on your computer). Note that this Disable feature only works on the site where you activate it: disabling Media Viewer on Wikimedia Commons will not disable it on your home Wikipedia or other sister projects. If you are a registered user, you can also disable Media Viewer in your "Preferences": select the "Appearance" section, and uncheck this option under "Files": '[ ] సరికొత్త బొమ్మలను చూసే అనుభూతిని సచేతనం చేసుకోండి’. Once you click "Save", images will no longer open in Media Viewer for your account on that site. How can I re-enable this feature? If you change your mind and wish to re-enable Media Viewer, visit any file description page on the site where you wish to use this tool. Then click on the 'cogs' icon next to the "Open in Media Viewer" button below that image: this will open it in Media Viewer, with the Enable panel open (see screenshot). Now click on "Enable Media Viewer". This Enable feature works for registered users (using a site preference), as well as unregistered or 'anonymous' users (using a file stored locally on your computer). Note that this Enable feature only works on the site where you activate it: enabling Media Viewer on Wikimedia Commons will not enable it on your home Wikipedia or other sister projects. If you find a technical issue, please file a bug here on Phabricator. You can also post your report on this discussion page, with a screenshot and information on your browser and operating system :). Before reporting a bug, check first that this issue is not already on this list of known bugs. In case it’s already been fixed, you may also want to test it on this test page on MediaWiki.org -- where new features are released a week before the rest of the wikis. Note: Media Viewer only supports the most widely used image file formats on Wikimedia sites (e.g. : JPEG, GIF, PNG, TIFF, SVG). In future releases, we plan to add support for more file formats, such as PDF, audio and video files. For more information about Media Viewer, visit the product overview page on MediaWiki.org. Media Viewer was developed by the Wikimedia Foundation's multimedia team from July 2013 to November 2014. It was designed in collaboration with community members, in a series of discussions held over video conferences, IRC, and face-to-face meetings. This tool was then developed and tested as a Beta Feature through April 2014, when it was gradually released worldwide, over a three-month period. Media Viewer was tested extensively with millions of readers and casual editors, the primary target users for this tool. User feedback was collected through usability studies, community consultations and online surveys. Based on this feedback, a wide range of improvements were developed to make Media Viewer easier to use, such as: an easier way to enlarge images, image captions, a prominent link to the File: page and an easier way to disable the tool for personal use. Many thanks to all the community and team members who contributed to this project. Special acknowledgements to the project team: Fabrice Florin, Gilles Dubuc, Mark Holmquist, Gergő Tisza, Pau Giner, Keegan Peterzell, Rob Lanphier, Howie Fung and Erik Moeller, to name but a few. To learn more about other multimedia projects, visit this Multimedia project hub. This page was last edited on 25 October 2018, at 22:29.